Dan walked away from the incline bench with a look of disdain as one of THE GYM members futilely did set after set of incline dumbbell presses. Dan had reiterated to the guy time after time that he was overtraining, but the guy kept coming on, burning up nervous energy and precious tissue. Intensity of effort is the key that Dan has been trying to get across to the members, but this is easier said than done. At times Dan has to incorporate heavy-light supersets and compound sets just to get a member INTENSE enough; not that these systems, in themselves, are creating growth - they are getting the individual to get deeper into the amount of effort he is putting into each set. I went down to Studio City the other day to visit Vince Gironda and rap with him. 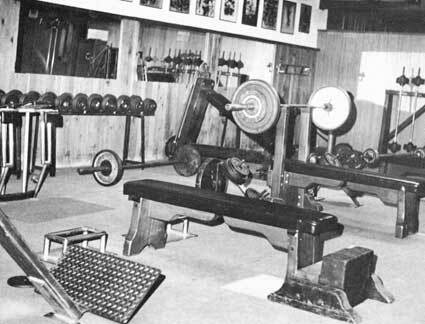 He has remodeled his famous gym and added some very earthy and beautiful benches made out of thick wood. The benches are of unique and functional design, yet have a medieval or old-world appeal to them. "They make fun and ridicule me," Vince said solemnly, "but once they see he finished product they all want to get on the bandwagon. When I started this project a lot of people put me down for the idea, but it has become popular and effective. Here, look . 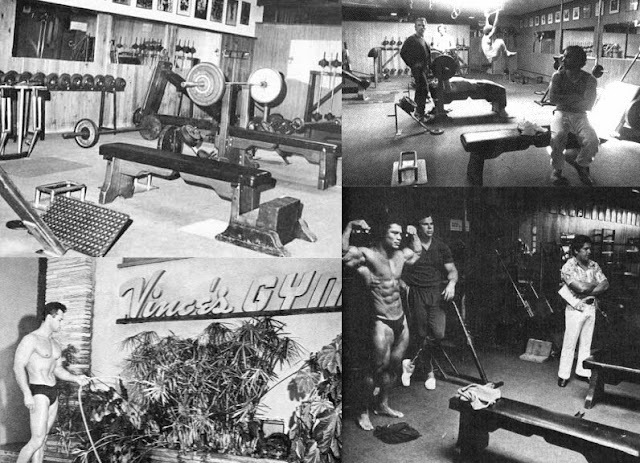 . . " With that, Vince whisked me over to the old Walt Baptiste leg press machine that Vince has used to make famous chests like Scott's, McArdle's and may others. Underneath lay a wooden bench that had been shaped like a woodcutter's bench and smoothed down by hand. In the ends were hewn and smoothed wooden pegs instead of screws (how complete - how thorough). He kept cracking jokes and telling me to pay attention to the important stuff, which was becoming almost impossible with the great influx of things he was throwing at me. I slid under the cross bar and was surprised how comfortable the bench was to lie on. "Go ahead and try a couple of reps. It is was good enough for Scott it's good enough for you!" he quipped. "See how comfortable a wood bench can be if it's shaped properly and treated." Actually, I was surprised at how little I was aware that the bench I was on was made out of wood. With that Vince motored over to a unique tricep pushdown bench, set at an angle to fully work the entire triceps area. What a machine! This guy has ALWAYS put together the MOST advanced benches and machines that are functional, and he's been doing it for the last 25 years. Vince became more and more excited as he showed me around. It was like watching this craftsman leaping around his shop of watches and clocks. Stopping here and there to give you a piece of the item's story. What a trip! Vince then told me of his latest protege, 42-year old Bill Howard. Bill has recently been training under the guidance of Gironda and has made unbelievable improvement. Recently he took second in the IFBB Mr. International and that ain't hay, brothers. I remembered Bill from the early days of Joe Gold's, but he never looked that impressive. Bill always had a well rounded and symmetrical build, but now he was getting shapely mass and deeper cuts. In 1972 I was in the IFBB Mr. Western America and Bill competed in the tall men's class. I hadn't seen Bill for years and I don't think he recognized me, but we rapped during the breaks in the show. He was unassuming and very casual, yet ready to go and he looked better than ever. We didn't talk training, but hit on the happenings of the evening because talking of training when Arnold is guest poser and there are scads of chicks in the audience just doesn't make sense. Top that with a mind-splitting exhibition by Ken Waller and you ARE distracted from the talk of your training. So, little did I realize that Bill Howard, newly accepted Doctor of Chiropractic, had begun utilizing some of the Gironda principles. Vince told me he had Bill doing only 3 sets of Sissy Squats for the thighs. This was done with a moderately heavy weight with great intensity. When a sticking point comes along Bill confuses it with a different application of the exercise, but still for 3 sets. This brings me to a big point with weight trainees who have been training without success. Dan and I get letters all of the time asking about how many sets to do. Most trainees use too many sets and overtrain their muscles. If the muscles lose tonus they will not grow and they will get spongy or small and stringy. Sounds radical, I know. Check form, diet and weights. If these factors are in order then you are not getting enough intensity to the muscle's effort; the stimulus is too weak. and so forth. Remember that a superset is a set involving two exercises (one per body part) done one right after the other without rest. Rest only 15-30 seconds between supersets. Therefore, you would do 8 reps of barbell curl, put the bar down and immediately go over to your tricep exercise and do 8-10 reps as soon as you can. The less pause between the two the better. Another method would be to increase to 6 sets per exercise to re-learn the feel and to aid in the concentration of effort in that movement. If, after 2 weeks on 6 sets per exercise, you can't get anything out of it try a new exercise. Sometimes you have to confuse a muscle to make it respond and Vince Gironda is a master at it. Dan Mackey has his pupils do hald and full movement to get into the exercise and the feel of it. He also uses a method of low burns which he feels is superior to the regular burns. The half/full sets are done just as the name implies. You do a half rep followed by a full rep. You count - half, one; half, two; etc. until you have done 6 to 8 reps (which is actually 12 to 16 moves). Dan feels this is a better way of getting people into the movements rather than starting them out with super high reps. Many people can't handle the high reps, especially beginners, because they lack the cardiovascular development and inner strength. The half-full technique is especially great for beginners and intermediates (1-2 years, sometimes depending on the level of involvement) as well as kids. I recommend this technique highly for anyone with a sticking point. Vince also uses the method of compound movements for breaking sticking points. You change the performance of the exercise, but still stay within your 3 set budget. Some examples are regular BB curls done immediately after 6 reps of Preacher curls, or the 3-way triceps compound. The dumbbell curl and press is a compound exercise. Try your own. Tri-sets (Triceps-Biceps-Triceps) and Giant sets have been discussed in a previous triceps article, and there are other methods which I will get into for the guy who has been training pretty hard for about 3 or more years. The basic format of 3 to 6 sets an exercise still holds true, but in his case he may have to do two or three exercises to fully work a stubborn muscle group. This is where you see advanced men doing 10, 15 and 20 sets per bodypart; they are doing 2-4 different exercises to shock a muscle group from all sides. More on this at a later date.